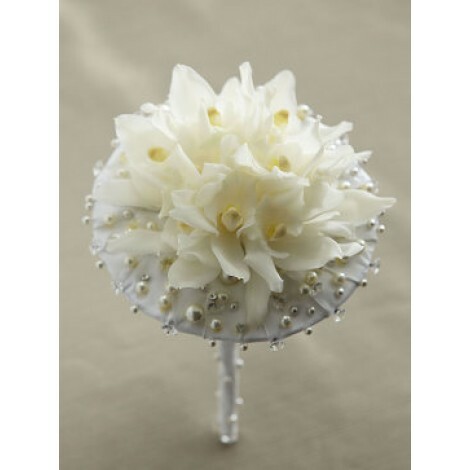 This elegant and eye-catching hand bouquet is the perfect addition for your big day! Make an extra special impact with this stunning, fairytale inspired white orchid bouquet set onto a intricate, sparkling, pearl bracelet. This stunning sparkling bouquet is sublime selection of mini white orchids arranged on an glistening and sparkling bracelet disk, designed to attract attention! 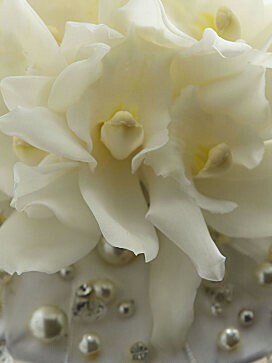 The elegant white mini cymbidium orchids and glistening disk are finished off to perfection with ivory satin ribbon encasing the stems. 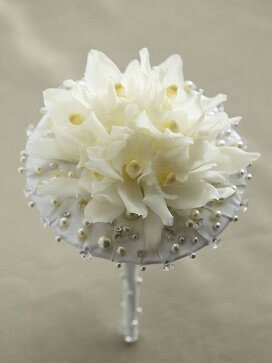 A true modern day fairytale bride or bridesmaids ideal bouquet!